In our commitment to help you start your skincare routine on the right track, we gathered and reviewed 5 of the top soaps specifically made for sensitive skin. These soaps were then assessed based on their ingredients, compatibility with sensitive skin and their affordability for us to pick what we think is the best soap for sensitive skin. For a dermatologist-recommended brand, try the Sensitive Skin Bar by Basis. Free of irritants, it gently cleanses the skin and contains Aloe and Chamomile to soothe and calm sensitive skin. The Virgin Coconut Oil Soap, Pure & Unscented by OrganicGOLD is a natural, handmade and organic soap. It also doubles as a natural deodorant to fight germs that cause body odor. Dove’s Go Fresh Cool Moisture Beauty Bar gently cleans without leaving a soapy residue. It boasts of its ¼ moisturizing cream content that hydrate and maintain the skin’s natural moisture. Go for the Natural Beauty Bar Sensitive by Tom’s of Maine for something infused with Vitamin E. Hypoallergenic, it has glycerin and other natural oils that help moisturize sensitive skin. This, for us, is the best soap for sensitive skin because it is free of any irritants. It also comes with Aloe Vera and Chamomile as a bonus, which help calm and comfort irritated, sensitive skin. This product offers the mildest and purest clean ever without the harsh ingredients. It is recommended by dermatologists, so you’re definitely in good hands with this soap. Designed for sensitive skin, this bar soap can also be used by those with oily skin. It leaves the skin tight and feel oil-free with every use, but doesn’t leave it dry unlike other harsh soaps. This bar soap calls itself a “non-soap” cleanser, and is seen as an alternative to soap. And since it has a pH level of between 5 and 6, it won’t irritate the skin which has a pH of around 4 to 5.5. Plus, it only makes use of 16 ingredients, so your sensitive skin will truly love this product. This soap is great because of its high glycerin content which hydrates the skin and seal in the moisture. It is also cold pressed and processed, to ensure all the healthy stuff is retained. These skin-friendly nutrients include p-Coumaric acid, Ferulic acid, monoglycerides, and Vitamins A, C, and E.
This product is pure and unscented, making it ideal for those with sensitive skin. It is also highly antibacterial and antiviral, which fight off bacteria that cause fungal infection and body odor. Lavender extracts are another great addition to this product, as they relax and soothe sensitive skin. And because of its healing properties, this soap can effectively balance all skin types. Non-comedogenic, this bar soap can help ward off dead skin cells, grime, and dirt. It is also quickly absorbed by the skin, and its VCO content helps replenish the skin’s natural oils. This product has been cured for 6 months for long-lasting, harder, and milder bars. These soaps have also undergone the curing process to rid of any lye that can cause serious health risks. This product is great for sensitive skin because of its ¼ moisturizing cream content. Additionally, it is infused with green tea and cucumber that help revitalize the senses. Dermatologist-recommended, this bar soap won’t dry out your skin the way soap can. It is safe for daily use, and is safe enough to be used on delicate areas like the face. Its ¼ moisturizing cream content helps hydrate the skin and maintain the skin’s natural moisture. It gently cleanses without drying out the skin, and does not leave a soapy residue. This bar also works great as a hand soap. Since the hands are one of the body’s driest parts, lathering them with this beauty bar can give them that extra boost they’ve always needed. Its benefits are incomparable, but what we didn’t like is that it is fragranced. Scented products are a big no-no for sensitive skin, but if you’re willing to take the chance, try this one out. The fresh scent of green tea and cucumber make this product perfect for hot, summer days. Can you imagine how refreshing it can be when you get off the shower? Hypoallergenic, this bar soap gently cleanses the skin while retaining its natural moisture. It is also free of artificial ingredients, or basically any junk you don’t want to come near your skin. This product combines Vitamin E, olive oil, and chamomile to leave skin fresh and clean while keeping it moisturized. It is dermatologist-tested and is free of any irritants that can harm skin. Aside from its effectiveness, nature lovers will love this product because of its packaging. The brand makes sure that they only use recycled materials, as their way of helping save the earth. This soap works well on mature skin. It doesn’t have any unnecessary lather, and a reviewer even stated that it left her aged skin soft and supple and makes her whole family use it too. What we really like is the company’s honesty. They list the ingredient, its purpose, and its source on their website, so you’re assured what you’re paying for is the stuff you really want. What makes this the best soap for sensitive skin is that it’s free of fragrances and is pH balanced. It is also highly moisturizing, and will greatly benefit those with normal to dry skin. This includes panthenol and Aloe Vera, ingredients which are proven to promote skin hydration. Along with other rich botanicals, this liquid soap contains Citricidal. Known as grapefruit seed extract, it has a lot of benefits including being antimicrobial, antibacterial, and antifungal. This product deeply cleanses to remove deep-seated dirt and is non-comedogenic. It is infused with plant moisturizers as well to restore the skin’s moisture levels and maintain its pH balance. Since it does not contain Sodium Laureth Sulfates, this product is not as foamy as other cleansers. It however contains vegetable glycerin, so you still get a subtle soapy effect. This results in a great cleaning effect minus all the lather that can cause irritation. And have we mentioned that this ingredient acts as a moisturizer to prevent itching and dryness? This may shock (or even disappoint) fans of body washes, but let us explain it a bit further. Compared to its liquid version, bar soaps have fewer dyes or fragrances, which mean a lesser chance of irritation. Bar soaps made for sensitive skin are also easier to find than body washes. The only downside we see is they have a higher pH, so they are more likely to dry-out the skin. So, how do you find the right bar soap for you? Those that are fragrance-free. However, if sweet-smelling or fruit-scented soaps are something you can’t resist, opt for those that have essential oils such as citronella or lavender oil. Those that contain preservatives and detergents, as these ingredients are harsh on sensitive skin. But it doesn’t end there. Here are some rules to follow before, during, and after bathing. Taking a bath should always be the first step when starting out our day. And, if you have sensitive skin, using any kind of soap is a big no-no because it can only make matters worse. 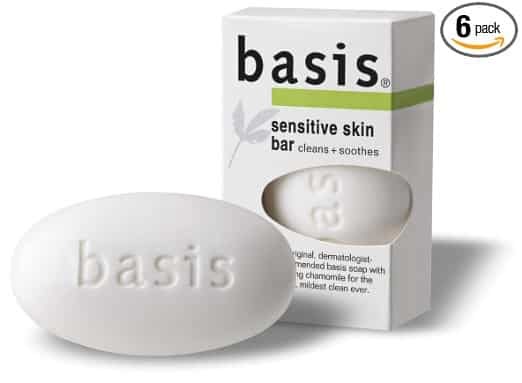 We have chosen the Sensitive Skin Bar by Basis as this round’s best soap for sensitive skin. It is free of dyes, fragrances or other harsh ingredients, and has Aloe and Chamomile to soothe and comfort skin. Recommended by dermatologists, it leaves skin comfortable, calm, and clean with a formula that’s super gentle and pure.